Sage oil (Salvia officinalis) - information on the origin, source, extraction method, chemical composition, therapeutic properties and uses. Sage oil is extracted from Salvia officinalis of the Labiatae family and is also known as garden, true and Dalmatian sage. Even though too high amounts of this essential oil can cause problems, it can be used with great effect on a variety of problems, as long as low percentages are used. It is great for relieving grief and quickening the senses, while stimulating the lymphatic system and helping with female problems, such as sterility and menopausal problems and on the skin it not only helps healing but also to reduce pore size. 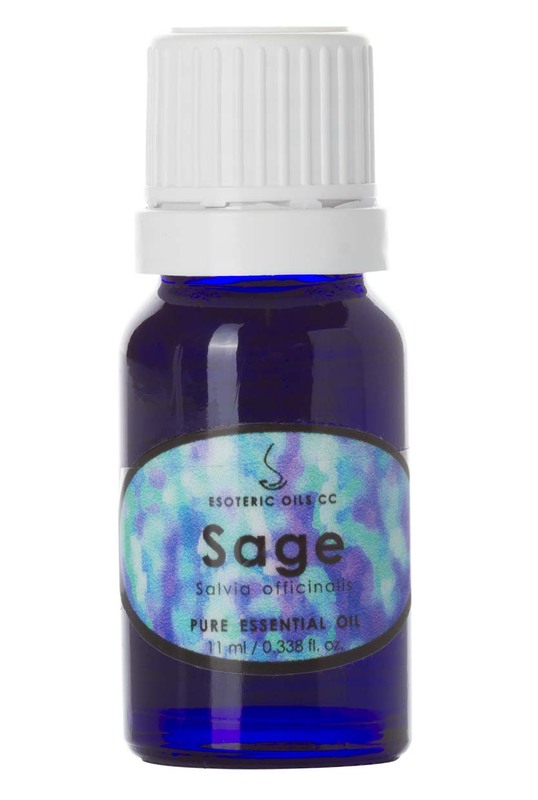 Sage oil has a sharp, herbal smell, and is watery in viscosity. It is an evergreen perennial herb that can grow up to about 60cm ( 2 feet) high with a woody base, soft gray-green oval leaves and a mass of blue or violet flowers. The Chinese believed that it cured sterility, while the Romans believed it cured just about everything. The name is derived from the Latin word 'salvare' which means 'heal' or 'save' and during the Middle Ages it was a popular ingredient of many nerve tonics and the herb was also used to clean gums. Sage oil is extracted from the dried leaves by steam distillation. The main chemical components of sage oil are a-pinene, camphene, b-pinene, myrcene, limonene, 1,8-cineole, a-thujone, b-thujone, camphor, linalool, bornyl acetate and borneol. Sage is a powerful oil and should be used with care. It is classified as an oral toxin and should be used with great care in aromatherapy. It should not be used during pregnancy, or by persons suffering from epilepsy or high blood pressure. The therapeutic properties of sage oil are anti-inflammatory, antibacterial, antiseptic, antispasmodic, astringent, digestive, diuretic, emmenagogue, febrifuge, hypertensive, laxative, stomachic and tonic. Although this oil has a high thujone content, and can therefore cause convulsions when used in high concentrations, it is effective to stimulate the digestion and specially a bad appetite and due to its hormonal regulatory effect, it is most useful for menstrual problems, as well as the pain associated with rheumatism. It helps to deal with grief and depression and quickens the senses and has been used to combat female sterility, as well as menopausal problems and has a tonic effect on the urinary tract as well as the liver and kidneys. Sage oil also stimulates the lymphatic system and thereby boost glandular function while it also has value to treat dermatitis, atonic wounds, sores, ulcers, as well as insect bites and reducing large pores. On the muscular system it can be used to ease stiff muscles and particularly fibrositis and torticollis (stiff neck) and eases trembling and palsy. If the toxic effects of sage oil bothers you, you could consider clary sage oil as it has similar properties as sage oil, but does not have the side effects. Even though sage oil can be toxic in too large dosages, it still offers some very good therapeutic properties which should be balanced against the side effects of this oil. Used in vapor therapy by means of a burner or vaporizer, this oil can be used to calm the nerves and help with grief and depression, while quickening the senses and aiding memory. When blended as a very small part of a massage oil, or used very sparingly in the bath, it can help with female sterility as well as menopausal problems while boosting the urinary tract, liver and kidneys, lymphatic system, while relaxing the muscles and sorting out fibrositis as well as torticollis - a stiff neck - as well as trembling and palsy. Although the risk of too much sage oil must be carefully weighed against the positive effect it can have, it can be used with success to reduce pore size, healing of sores, atonic wounds, psoriasis, dermatitis as well as ulcers. Although essential oils blend well with one another, sage oil blends particularly well with bergamot, lavender, lemon and rosemary.